The U2 front man was presented the Commander of the Order of Arts and Letters by French minister of culture Aurelie Filippetti in a ceremony at the Ministry of Culture and Communication in Paris. The accolade was awarded in recognition of his contribution to music and the arts - but the Irish rock star said it "belongs to the band". Speaking about Bono, Minister Filippetti said: "Beyond notes and beyond words, you committed yourself and dedicated your fame and career to wage some of the greatest wars of our time. "Not for charity's sake but in the name of Justice." 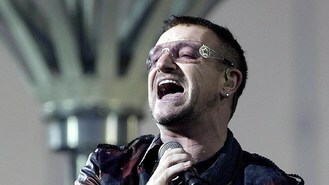 Reflecting on his win, Bono said: "This is a huge honour for me, but really it belongs to the band. I've got the biggest mouth and the loudest voice but the music we make comes from each other. "Being an Irish Francophile, a student of many great French artists and writers... it is unspeakably special to receive an award from France for being an artist. Thank you." Previous recipients of the award include fellow Irishman poet Seamus Heaney, singer Patti Smith, playwright Vaclav Havel, singer David Bowie, artist Anish Kapoor, writer TS Elliot and songwriter Bob Dylan. Bono's award follows a further honour which was awarded in 2003, when he received the prestigious French decoration, the Legion d'honneur from the then president Jacques Chirac. Other awards received by the U2 vocalist include Time Magazine's Person of the Year in 2005, and an honorary British knighthood in 2007.